After seven years of war, American foreign policy has become nearly synonymous with the brawny side of its military. But the US armed forces may now be moving to show a different face to the world. Last week, Defense Secretary Robert Gates recommended an admiral better known for humanitarian and diplomatic initiatives than for muscle-flexing to assume a critical command post in Europe. Adm. James Stavridis is an unusual choice to fill a job usually held by the Army. In his two years overseeing US military operations in South and Latin America, he has built a reputation for running a different kind of command – deploying hospital ships and soccer teams while contending with drug trafficking and corruption. Stavridis may be able to bring that balance to Europe, where deliberations over Afghanistan over the next few years will be critical to that mission’s success. “It’s a terrific appointment,” says Carola. China’s military has a new weapon in the country’s soft-power arsenal that copies a technique long used by the United States – a 10,000-ton hospital ship to be deployed for humanitarian purposes in Asia and beyond. The vessel, dubbed Ship 866, is meant to soften China’s image overseas and allay concerns among its neighbors over its navy´s growing strength, while at the same time adding to its military capabilities, analysts say. The ship’s arrival coincides with clear signs that the Chinese military is tentatively moving away from its policy of maintaining a low international profile to avoid provoking those who doubt its commitment to a “peaceful rise” doctrine. Chinese warships last month began patrolling the pirate-plagued waters in the Gulf of Aden – the first time they have ventured out of the Pacific on a combat mission since the 15th century. A top Chinese defense military official said recently that China is seriously considering adding its first aircraft carrier to its naval fleet. Ship 866 makes “the country one of the few in the world that has medical care and emergency rescue capabilities on the high seas while also raising the capability of the Chinese navy to accomplish diversified military missions,” the Communist Party newspaper People´s Daily said recently. Specialized hospital ships have military purposes – to treat battlefield casualties and provide support to amphibious assault ships – but are used most often for humanitarian and disaster relief missions, said Robert Work, a naval analyst at the Center for Strategic and Budgetary Assessments in Washington. The United States has two dedicated hospital ships, each equipped with 1,000 hospital beds: the USNS Comfort and USNS Mercy. The humanitarian situation in the Gaza Strip is “shocking”, the head of the International Committee of the Red Cross said after a visit to a hospital in the embattled territory. “I saw this dramatic humanitarian situation. There’s an increasing number of women and children being wounded and going to hospitals,” Jakob Kellenberger told reporters in Jerusalem. “It is shocking. 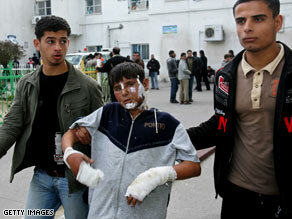 It hurts when you see these wounded people and the types of wounds they have. And I think that in addition the number of people coming to these hospitals is increasing,” he said. “It is a positive step that you have a three-hour stop in the fighting, for doing humanitarian work, but it is not sufficient,” he said. Kellenberger — who also visited the Israeli border town of Sderot, which has been hit by hundreds of Palestinian rockets since the war began — urged both sides in the conflict to differentiate between militants and civilians. He said medical supplies are holding up in Gaza, where over 1,000 people have been killed in heavy fighting and aerial bombardments since the December 27 launch of the largest-ever Israeli offensive on the territory. That was the word today from U.N. aid workers after the UN shut down humanitarian supply efforts into Gaza. The United Nations halted aid deliveries to the besieged Gaza Strip on Thursday, citing Israeli attacks on its staff and installations hours after it said tank fire killed one of its drivers as he went to pick up a shipment. The United Nations has already demanded an investigation into Israel‘s shelling of a U.N. school in Gaza that killed nearly 40 people earlier this week. Israel and residents said militants were operating in the area at the time. For a second straight day, Israel suspended its Gaza military operation for three hours to allow in humanitarian supplies. Shortly before the pause took effect, however, the U.N. said one of its aid trucks came under Israeli fire, killing the driver. U.N. spokesman Adnan Abu Hasna said the U.N. coordinated the delivery with Israel, and the vehicle was marked with a U.N. flag and insignia when it was shot in northern Gaza. The Israeli army said it was investigating. As dark fell in Gaza this Wenesday, January 7, 2009, day 12 of the Israeli action called Cast Lead, fighting resumed between Hamas and Israeli forces in Gaza…. During the 1 PM to 4 PM humanitarian re-supply, Hamas attacked Israelis who responded. But the day was significant still for the first stop in active combat with a three hour “time out” to allow humanitarian supplies into Gaza. U.N. Relief and Works Agency spokesman Chris Gunness said a three-hour truce is just not enough to alleviate the “deepening humanitarian crisis” in Gaza. He wanted a longer, daily reprieve. Israeli Defense Ministry spokesman Peter Lerner said three hours will have to be enough for now, and probably only every second day. “We need to build on this three-hour window; we need to expand that window and let it lead to a permanent cease-fire,” Gunness said. Israel agreed on Wednesday to send two diplomats to Cairo for cease fire planning. Amos Gilad of the Defense Ministry and Shalom Turgeman, a political adviser to Israeli Prime Minister Ehud Olmert could travel to the Egyptian capital as early as Thursday. French Foreign Minister Bernard Kouchner said that France is getting “very positive signals from the region” about the cease fire plan. The plan is being put forward by France, Egypt and Turkey. When asked about the plan, France’s President Sarkozy said “acceptance” by Israel and the Palestinian Authority. He did not mention Hamas or define further the state of agreement. The Palestinian Authority said it supported the plan but Hamas remains “not totally engaged” according to one observer in the discussions. He said Israel is weakening Hamas but Hamas remains in control of the Gaza Strip and the group remains a threat to Israel…. Threats against Israel continued with a verbal attack from Hezbollah, Irael’s foe in battle in 2006. Hezbollah chief Hassan Nasrallah said Wednesday “all possibilities” are open against Israel and warned the Jewish state’s 2006 war with his party would resemble “a walk in the park” in the event of renewed conflict. “We have to act as though all possibilities are real and open (against Israel) and we must always be ready for any eventuality,” said Nasrallah, whose Shiite militant party is backed by Syria and Iran. Tens of thousands of Hezbollah supporters marched in support of Hamas today in Beirut. They loudly protested the Israeli attack on Gaza. The day after Israeli mortar shells killed as many as 40 Palestinians, among them women and children, outside a United Nations school in Gaza, diplomatic efforts to bring the fighting to a halt intensified. France and Egypt and Turkey were working on a plan that would work to halt rocket fire from Gaza into Israel, open up crossings into Gaza from both Israel and Egypt, and end weapons smuggling from Egypt. The French president, Nicolas Sarkozy, said the cease-fire plan had been agreed on, but Israel and Hamas both said that there were many details to be worked out. Israel was due to send officials to Cairo for further discussions. Israel is seriously considering the Sarkozy-Mubarak cease-fire proposal. But Israel is already also considering an escalation of the fighting in Gaza. According to Israeli officials, the cease-fire proposal is based on the establishment of an international force to prevent the smuggling of weapons from Sinai into Gaza, which would see an increase in the number of US military engineers already on the Egyptian side of the border. The IDF is conditioning its acceptance of a new cease-fire with Hamas on the establishment of such a supervision mechanism in the Gaza Strip and along the Egyptian side of the Philadelphi Corridor to prevent the smuggling of weaponry and explosives from Egypt. Egypt said on Tuesday night that it was proposing an immediate cease-fire, followed by talks on long-term arrangements for borders and crossings. Olmert, on a tour of the South Tuesday, laid out the principles for an end to Operation Cast Lead. Meanwhile, Israel said that it has agreed to set up a “humanitarian corridor” to ship vital supplies to the people in the Gaza Strip. The office of Prime Minister Ehud Olmert said in a statement that the humanitarian corridor idea came from the UN Security Council, and he accepted it. You are currently browsing the archives for the humanitarian category.